The 2013 presidential election in Armenia was a hot topic on Twitter on Feb. 18. Though use of this microblogging platform is not widespread in Armenia, I decided to write about some of what makes Twitter unique. Hashtag: The # symbol, when placed before words in a message on Twitter (known as a "tweet"), allows users to archive keywords or topics, making them easily searchable. For example, the easiest way to search for information about Armenia in Twitter is to search with the hashtag #Armenia. Twitter Trend: a word, phrase or topic in Twitter that is mentioned more frequently than others. Trends can be considered the unique pulse of the Internet. They can be viewed on a Twitter user's homepage and highlight what the world is talking about at that moment. Tailored Trends: Twitter has defined settings for users to see trends "tailored" to their interests, which are based on users' location and who they follow on Twitter. The most important and influential of these are worldwide trends, which takes into account all conversations happening on Twitter from around the world. #armvote13 was used as the hashtag for those tweeting about the Feb. 18 presidential election in Armenia on Twitter. About 4 hours after the polling stations closed, active "tweeps" (Twitter users) were overjoyed to see that #armvote13 among the top trends of the world's largest microblogging site. This news was quickly spread in the Armenian social media sphere and was just as quickly clarified with accurate information. The hashtag for Armenia's presidential election was not in fact trending worldwide but was among users' Tailored Trends. 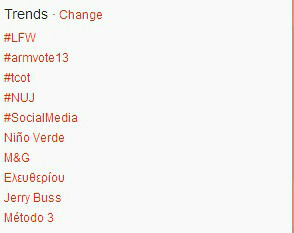 Of course, the fact that #armvote13 wasn't a worldwide trend doesn't mean there was little interest toward the hashtag. This is the second time when news about Armenia or an Armenian topic made it into the list of trends. 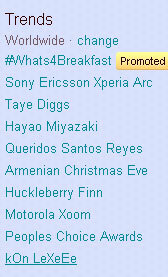 The first time was on Jan. 6, 2011, when the phrase "Armenian Christmas Eve" was trending worldwide. Greatly contributing to the success of this trend was Armenian-American celebrity Kim Kardashian, and her sisters and brother, who, it's fair to say, are quite influential on Twitter. The second part of the Feb. 18 adventures of #armvote13 had to do with hijacking of the hashtag. Beginning from the second half of election day, a large army of Twitter's Azerbaijani users hijacked the #armvote13 hashtag to pursue their own agenda. They attempted to spread anti-Armenian propaganda, achieving some success. There were times when dominating the #armvote13 feed was information that was pro-Azerbaijani, having nothing to do with the election itself. Katy Pearce, an assistant professor and researcher specializing in technology and media use in the former Soviet Union, was regularly tracking the #armvote13 hashtag on election day. In her network analysis, she found that Rauf Mardiyev, chair of the IRELI public union ("a youth NGO that has very strong ties to the ruling party"), was at the center of the group of Azerbaijanis taking over the #armvote13 hashtag. She also said that she's seen this before: "The same group of Twitter users were posting duplicate tweets, a few minutes apart, on a different hashtag" (the hashtag #khadijautan, which was used by activists fighting for democracy in Azerbaijan). The full analysis of the #armvote13 hashtag can be viewed on Katy Pearce's website. In the analysis, group 1 is comprised of foreigners and some Armenians, group 2 are Armenians from Armenia in Armenia, and group 3 are the Azerbaijanis who tried to hijack the hashtag. The Azerbaijani interference into the #armvote13 hashtag was a new experience for Twitter users in Armenia. It's obvious that we will be faced with this challenge also on April 24, Armenian Genocide Rememberance Day. On this day, the hashtag #ArmenianGenocide is often used. And we can expect IRELI to once again hijack a hashtag for Azerbaijani propaganda purposes.